The all-new Vortex Sleeveless redefines XTERRA's most popular sleeveless wetsuit. This is the #1 best selling sleeveless wetsuit in North America. It is great for training and racing. Optimally designed for increased flexibility and buoyancy, the Vortex Sleeveless is ideal for athletes who want an all-around wetsuit in the water. The sleeveless design provides natural range of motion while racing and training, providing athletes the best output per stroke. From the chest to the ankles, the entire front of this wetsuit is 5 mm, which is the maximum legal thickness for USAT (USA Triathlon) and WTC (Ironman). The back ranges from 2 mm to 3 mm for excellent flexibility and mobility. ALL AROUND TRAINING / RACING. All Race and training conditions where speed is key and flexibility is ideal. FRONT: 5.0 mm-thick neoprene from neck to ankles. BACK: 3 mm Super GKA neoprene. Sleeveless design allows for a more natural feel in the water, reducing drag and increasing freedom of movement. Lower-profile collar adds comfort and increased durability to ensure that the suit will stay intact and in place. X-MAX Seam-Seal technology uses a triple layer of glue and double-blind stitching to ensure long-lasting waterproof seams. At XTERRA Wetsuits Australia (TITAN Performance Group) we want to make sure that you are 100% satisfied with your new wetsuit. If the wetsuit doesn't offer you a perfect fit, or if you need to exchange for a different size or simply can’t find ultimate comfort in your new suit, we will happily accept a return or exchange within 30-days of receipt of the order. Our 30-DAY MONEY BACK GUARANTEE will allow you to purchase your new XTERRA Wetsuit from us with confidence. We recommend you try on your wetsuit upon receiving it to ensure that the sizing is correct even if you do not plan to use it right away. This way you have the opportunity to exchange the wetsuit within the trial period if necessary. We are committed to sizing every customer correctly and ensuring satisfaction with every purchase. All purchases made directly from XTERRA Wetsuits Australia (TITAN Performance Group) include a 30-day size guarantee to allow you to test the fit and performance of your wetsuit. Size exchanges, models exchanges, and refunds will be accepted within 30-days from the date of purchase. All returns and exchanges must be clean, dry, undamaged, unaltered, and properly folded. You are responsible for the return shipping to XTERRA Wetsuits Australia (TITAN Performance Group), and we will cover the shipping on the exchange back to you, if the wetsuit is covered under the exchange policy. Refer to Returns & Exchanges for further information. Thank you for choosing XTERRA WETSUITS! You have purchased the world’s fastest & most flexible brand of wetsuits. An XTERRA Wetsuit, worn by the world's elite triathletes and holds the world record for fastest swim while wearing a wetsuit. 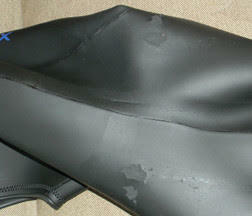 By reading this guide, you will extend the life and quality of your wetsuit. It can easily be penetrated. 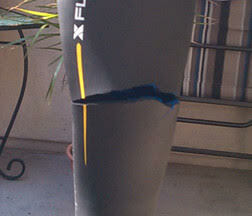 Please use extreme caution when trying on and adjusting your wetsuit. Suits with a rip in the neoprene are NOT valid for a refund, exchange, or warranty claim. Please read this guide and SWIM in your suit before requesting an exchange! Your wetsuit will expand half of a size in the water! Take caution when putting on your wetsuit. Take your suit for a test swim in open water. Rinse thoroughly with fresh water after each use. Allow your suit to dry inside-out in a cool place; once dry, turn suit right-side-out. Fold wetsuit in half over a thick hanger, hang on a padded wetsuit hanger, or properly fold your suit to store. Pinch, pull, or use fingernails when putting on your wetsuit. Zip your own wetsuit; ask for assistance from another person to avoid damage. Swim in chlorinated water (unless it's your only option - be sure to thoroughly rinse with fresh water immediately after exiting water). 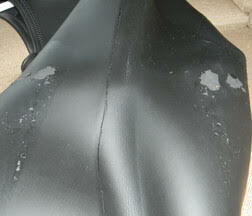 Leave wetsuit to dry in direct sunlight or heat as your suit can melt. Fold, crumple, or improperly hang wetsuit; do not store inside-out. 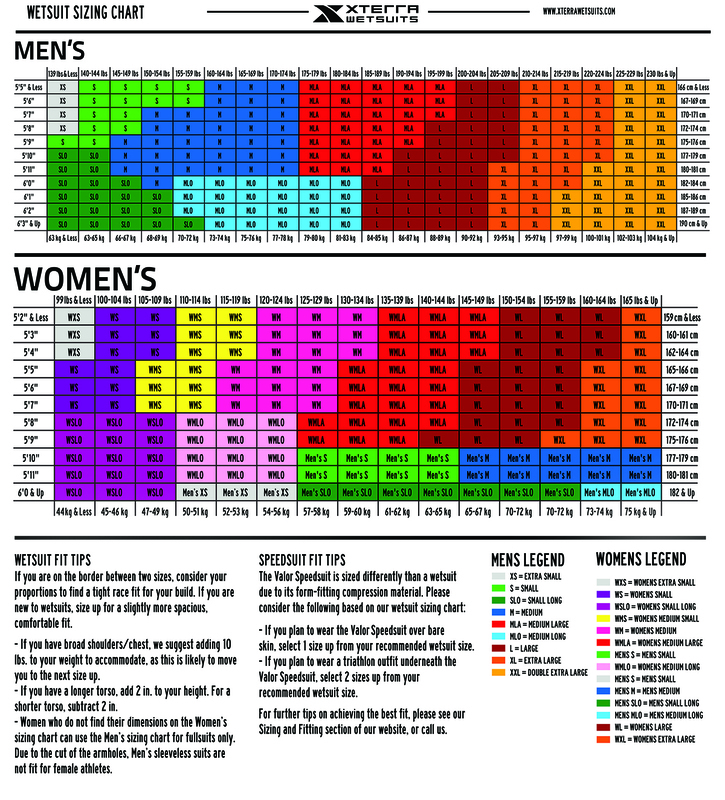 XTERRA Wetsuits is committed to sizing every customer correctly and ensuring satisfaction with every purchase. We highly encourage you to swim in your wetsuit before making a final purchase decision. All purchases made directly from XTERRA Wetsuits Australia (vide TITAN Performance Group) include a 30-day size guarantee to allow you to test the fit and performance of your wetsuit. Size exchanges, models exchanges, and refunds will be accepted within 30-days from the date your order. You are responsible for the return shipping to XTERRA Wetsuits Australia (vide TITAN Performance Group), and we will cover the shipping on the exchange back to you, if the wetsuit is covered under the exchange policy. XTERRA Wetsuits are designed specifically for open water and triathlon swimming; they can be used in all open water swimming conditions. We discourage the use of your XTERRA Wetsuits in chlorinated water as chlorine is corrosive and voids the warranty. If due to winter weather constraints this is the only way to ensure the correct sizing of your suit, please limit the time the suit is in the water and rinse thoroughly with fresh water after each use. Avoid excess heat, sunlight exposure, sharp objects, and unnecessary folding. A heel tear is caused by the foot, generally the heel, going through the leg of the suit while forcefully putting the suit on or taking it off. This damage is not easily repaired. The best option is to cut off the leg above the tear. The best way to avoid tears like this is to put a plastic bag over the foot when putting on the suit to reduce friction. The highly flexible neoprene used in to make XTERRA Wetsuits are susceptible to melting when exposed to heat or direct sunlight. Damage like this most often occurs when the suit is left inside out to dry in a warm place like a garage, trunk, or outside in the sun, although it can happen any time the suit is exposed to moderate to extreme heat. The inside of the suit is insulated by the neoprene and causes it to get hot enough to cause the high performance neoprene to melt together. When the suit is pulled apart, parts of the suit may remain stuck together. Damage like this is not easy to repair. The best option is to avoid damage like this by drying your suit in a cool place out of the sun and to not leave your suit in the car longer than necessary. 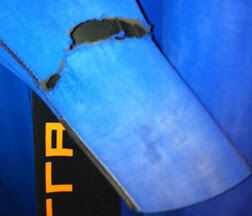 For repairs that can’t be glued at home, we highly recommend sending your wetsuit to a specialist wetsuit repairer. Please contact us and we can recommend a preferred partner in your area.